When I was a kid, we pronounced the capital city of what was then Czechoslovakia as if it had a long-A. I actually remember when the Soviet troops invaded Czechoslovakia in 1968, there was some talk of World War Three and I was worried that my older brother Tommy would have to go fight--in "Praig." My question to you is, would you remember how you pronounced the name of a foreign capital that had nothing to do with your lives? And my answer to you is, you sure would if you had the same mom as I did, and her name was Huena. And here's why: That city is home to a little statue of Jesus, known as The Infant of Prague. And in the Carter household, the Infant of Prague was as alive as, well, a real baby. And she pronounced it "Praig." 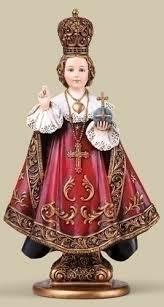 My mom had Infant of Prague statues and/or pictures in, I'd wager, every second room of our three-bedroom house. Turns out not everybody shared my kinship with the statue. Last year, when my wife Helena and and I found ourselves in Prague--and by now pronounced "Prog,"--I got all excited and said we had to go see the the statue that my mom had so adored, Helena was like, "infant of what?" She did, though, concede to visit the cathedral where the real McCoy was and I'd have to say, as my mother might, "she's no worse for the wear." I learned something, too. When I told one of the priests in Prague that my mom was a huge fan, he asked if I'd been raised in an Irish Catholic household. My answer was of course "yes" but my answer should have been something like: "my mom had statues and holy pictures in every room in the house. She had us go to church on many days beyond Sunday and we prayed the rosary regularly and even if you weren't Catholic if you were visiting our house the nights we said 'the beads' as we called it, you'd be joining us. My mom brought all of the good things about being Catholic into our lives and as far as I can tell, none of the not-such-great things. So, yeah you might say I was raised in an Irish Catholic household." We had lots of books in the house and more than one of them was called "Lives of the Saints." Some people know their hockey players; Huena knew her saints. And she put them to work for her. Like I said, when we were kids Huena sometimes wanted us to attend Mass in the mornings, even when it wasn't Sunday. "Alex, Eddie and Peter," she would call from the bottom of the stairs up to the bedroom room where I and my two brothers lay in bed, hanging on to our blankets, pillows and mattresses as if they were life rafts and leaving them would mean instant drowning. "It's the feast of Saint FILL IN SAINT'S NAME HERE! Get up for Mass!" Eventually and almost always in the following order--Peter then Alex then Eddie--we would cave and get up. In the Catholic faith, every day is some saint's feast day. It's usually the day they died or maybe the day they were canonized. There are more saints than days so sometimes, a day belongs to a small group of them. Today, Thursday October 12 is the feast of St. Wilfrid and I'd be very surprised if my second cousin Wilf Stacey doesn't know this because his mother Mary was as big a saint fan as Huena. Speaking of moms named Mary, tomorrow, October 13, also happens to be the 100th anniversary of the sixth time Jesus's mom appeared to six Portuguese kids in Fatima. We had several Our Lady of Fatima statues in our house. Tomorrow also happens to be Friday the 13th. And here's something you may not have read before--a Psychology Today article on "Why Superstitions work. But I digress. In the house I was raised in, saints were as much a part of our lives as aunts and uncles cousins like Wilf from three paragraphs ago. And they were a very helpful bunch. If you were going travelling, you'd want to have a little statue of St.Christopher, patron saint of travelers nearby. Even non-Catholics know that St. Anthony helps you find stuff. Last Wednesday, I misplaced my new glasses. This morning, I texted my wife with this:"Good news! I found my glasses." I typed, "Er, St. Anthony miraculously put them into a little-used pocket of my denim jacket." And Helena, who calls me the most superstitious person she's ever met, responded with, "Very thoughtful of him." Just occurred to me. I've been looking around for more than my glasses last week. And it wasn't until Tony came good with my specs that I realized I'd also been looking for something to blog about. Another couple of saints got a lot of attention chez Carter. For some reason I remember mom praying to St. Maria Goretti,whose name I always found euphonious and then very recently, I checked out her specialty; she keeps creeps away from young girls. Sometimes, saints are so good at what they do that they graduate from heaven to having a secular job here on earth. St. Francis of Assisi is one of those guys. I blame the hippies for that one. And I just learned he's not the only Assisi. My daughter Ev Frances has a pal named Aaron and he has introduced a marvelous new product named after St. Clara of Assisi. The product? Gluten-free water. Gluten-free water. I tell ya. Some people will believe anything. Hi Janet. Thanks for reading. Amazing how we turn into our parents, huh? I'm sure glad I liked both of mine. Take care.